Objective: Our aim was to investigate the correlation between free fatty acid (FFA) spectrum, blood stasis (BS) score, and macroangiopathy in type 2 diabetic patients with or without BS, as well as the possible relationship between BS and lipotoxicity. Methods: A total of 50 type 2 diabetes (T2D) patients with or without BS were enrolled from June to December 2014 in Shenzhen Traditional Chinese Medicine (TCM) Hospital, with 25 patients allocated to each of two groups. Basic information, BS score, blood glucose, blood lipids, etc., were measured for each patient. In addition, we tested the levels of interleukin (IL)-6, tumor necrosis factor α (TNF-α), and IL-18 with enzyme-linked immunosorbent assay. The macroangiopathy status of patients in the two groups was examined by color ultrasound and all factors related to BS scores were analyzed. 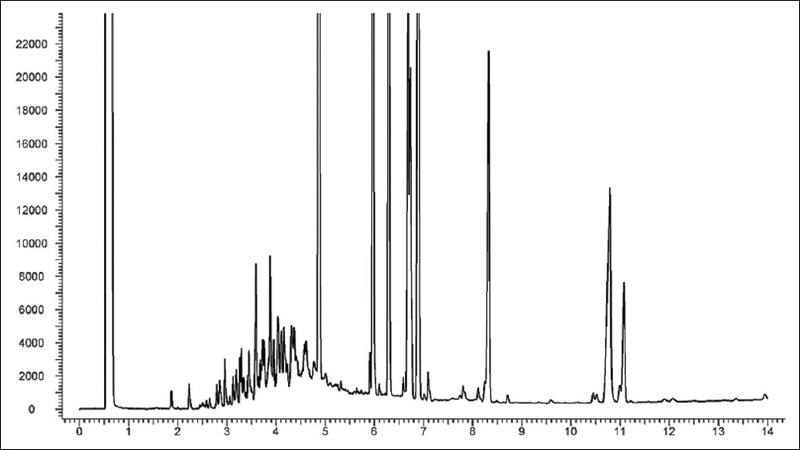 Gas chromatography-mass spectrometry was used to explore the difference in the serum FFA spectra between the two different groups. In addition, the relationship between FFA spectra, BS scores, and macroangiopathy was analyzed. Results: BS scores, total cholesterol (TC), total triglyceride (TG), low-density lipoprotein cholesterol, IL-6, TNF-α, IL-18, carotid and femoral artery plaque, carotid intima-media thickness, carotid plaque area, and femoral artery plaque area were all significantly increased in T2D patients with BS syndrome (P < 0.05). A positive correlation was observed between age, duration of diabetes, carotid intima-media thickness, carotid plaque area, femoral artery plaque area, and BS score (P < 0.05). A total of 21 fatty acids were found in the serum, and total FFA (TFFA), saturated fatty acid (SFA), lauric acid (C12:0), palmitic acid (16:0), stearic acid (C18:0), arachidonic acid (C20:4n6), behenic acid (C22:0), and lignoceric acid (C24:0) scores were all found to contribute to the difference between FFA spectrums of the two groups; of the fatty acids, C12:0, C16:0, C18:0, C22:0, TFFA, and SFA positively correlated with BS scores as evaluated by Pearson's or Spearman's correlation analysis (P < 0.05). Only SFA entered the regression equation in the multiple linear regression analysis. C12:0, C16:0, C18:0, C20:4n6, TFFA, and SFA were positively correlated with carotid plaque area, whereas linoleic acid (C18:3n3), Cis-5, 8, 11, 14, and 17-eicosapentaenoic acids (C20:5n3) were negatively correlated (P < 0.05). C16:0 was positively correlated with the femoral artery plaque area and C18:3n3, cis-4, 7, 10, 13, 16, and 19-docosahexaenoic acids (C22:6) and nervonic acid were negatively correlated (P < 0.05). Conclusion: Serum FFA spectra were significantly different between T2D patients with BS and those without, and long-chain SFA made the greatest contribution. Serum FFA spectra were correlated with BS scores and diabetic macroangiopathy, which means that lipotoxicity and BS are correlated in T2D. Nevertheless, in Traditional Chinese Medicine (TCM), diabetes is recognized as “Xiao-Dan,” “Xiao-Ke,” or “Pi-Dan” in the masterwork “Huangdi's Classical Internal Medicine.” Traditional theory regards the “impairment of Yin by dryness-heat,” “deficiency of Qi and Yin,” and “deficiency of both Yin and Yang” as the main pathogenesis of Xiao-Ke. Modern research on TCM indicates that blood stasis (BS) plays a vital role in the development of Xiao-Ke and its complications. BS, which is gradually generated and aggravated in the vascular network by a viscous and slow bloodstream, is the result of dryness-heat and a deficiency of Qi and Yin. It leads to an obstruction of the circulation of Qi and blood and consequent complications, especially macroangiopathy, which causes symptoms such as numbness, pain, and cold limbs, and sometimes even myocardial or cerebral infarction. Thus, BS is to Xiao-Ke what lipotoxicity is to diabetes and its complications. This leads to the question of whether there is a relationship between BS and lipotoxicity. Therefore, in this study, we investigated the correlation between the FFA spectrum and the TCM score of BS and angiopathy in T2D patients with or without BS. A total of 50 T2D patients were enrolled at the Shenzhen TCM Hospital from June to December 2014, according to the World Health Organization (WHO) criteria (1999); 25 of these were confirmed to display BS patterns (BS group) according to TCM syndrome definition (as per “Clinical Terminology of Traditional Chinese Medical Diagnosis and Treatment-Syndromes, GB/T 16751.2-1997”), whereas the other 25 display no BS indicators (non-BS [NBS] group). An additional inclusion criterion was patient's age to be from 30 to 80 years. The research ethics boards of Shenzhen TCM Hospital approved the study, the ethics and full study were approved by the ethics committee of Shenzhen TCM Hospital, and all patients signed written informed consents. Patients with the following conditions were excluded: (1) malignant tumor, hypertension, coronary heart disease, or severe damage to the heart, liver, or kidneys; (2) women who were pregnant, planned to be, or were nursing; (3) those who suffered from acute diabetes mellitus complications (including diabetes ketone acidosis, diabetes lactic acidosis, and diabetic nonketotic hyperosmolar syndrome) in the preceding month; (4) those who had been treated with Chinese herbs promoting blood circulation to remove BS in the preceding 1 month; and (5) other situations which the researchers believed to be inappropriate. Gender, age, duration of diabetes, height, weight, and body mass index were all recorded. The BS syndrome score was calculated according to “The guidelines for clinical research of new TCM drugs on the treatment of BS syndrome (2002)” published by the Chinese Ministry of Health. The levels of fasting plasma glucose (FPG), 2 h plasma glucose (2 hPG), glycosylated hemoglobin (HbA1c), fasting C peptide (FCP), 2 h C peptide (2 hCP), total cholesterol (TC), total triglycerides (TGs), low-density lipoprotein cholesterol (LDL-c), high-density lipoprotein cholesterol (HDL-c), lipoprotein a (Lp[a]), and the inflammatory factors interleukin (IL)-6, IL-18, and tumor necrosis factor-α (TNF-α) were all examined (Plasma glucose and lipids kits were from Roche, Basel, Switzerland; HbA1c kit was from Primus, Kansas, USA; C peptide kit was from Abbott, Chicago, USA; IL-6, IL-18, and TNF-α kits were from R and D Systems, Minnesota, USA). Blood samples were taken at 8:00 am, the plasma was separated and preserved in a −80°C refrigerator. All the above examinations were performed in the clinical laboratory of Shenzhen TCM Hospital. An Acuson Aspen Advanced color Doppler ultrasonic tester and L7 10-MFz Variable frequency probe (Phillip, Amsterdam, The Netherlands) were used. The intima-media thickness of a defined area (10 mm to near-end of carotid sinus) in the carotid artery was tested, along with the vascular wall structure, carotid plaque area, and the femoral artery plaque area. All the above examinations were carried out by the same doctor. Blood samples were taken at 8:00 am; the serum was separated and preserved in a −80°C refrigerator. FFAs were examined using a gas chromatography-mass spectrometer (GC-MS) (Shimadzu, Kyoto, Japan). All FFA standards were from Sigma, California, USA. 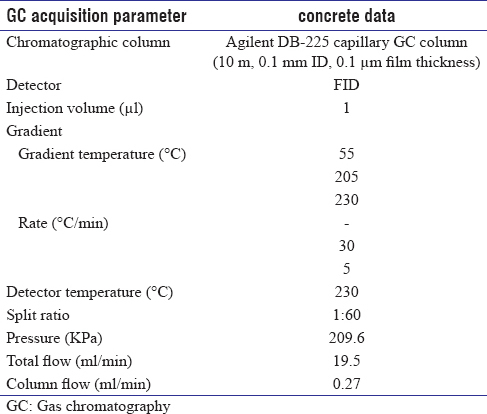 The conditions for the gas chromatographic analysis are shown in [Table 1]. Data conforming to a normal distribution are expressed as mean ± standard deviation. Differences between groups were compared using an independent-sample t-test for continuous variables or the Chi-square test for categorical variables. Data that did not conform to a normal distribution are expressed as medians (1st quartile, 3rd quartile), and the Wilcoxon rank-sum test was carried out to compare differences between the two groups. A correlation analysis was carried out using Pearson's linear correlation analysis (normal distribution) or Spearman's rank correlation (abnormal distribution). All analyses were performed with SPSS (IBM, NY, USA) 16.0, and a P < 0.05 was considered statistically significant. Data from the GC-MS were analyzed with Simca-P 11.5 software (Sartorius, Niedersachsen, Germany), and principal component analysis (PCA) and partial least squares-discriminant analysis (PLS-DA) were carried out to determine the clustering of different groups and to analyze the differences between groups according to the contributions of components in sample clustering. Gender, age, and duration of diabetes were not significantly correlated between the groups (P > 0.05) [Table 2]. BS syndrome scores in the BS group were significantly higher than those in the NSB group (P< 0.01) [Table 2]. 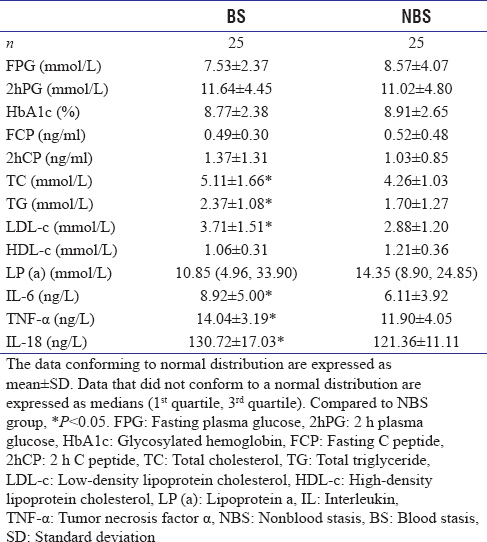 TC, TG, LDL-c, IL-6, TNF-α, and IL-18 were all significantly higher in the BS group than in the NBS group (P< 0.05); however, levels of FPG, 2 hPG, HbA1c, FCP, 2 hCP, HDL-c, and Lp (a) were not significantly different between the two groups (P > 0.05) [Table 3]. 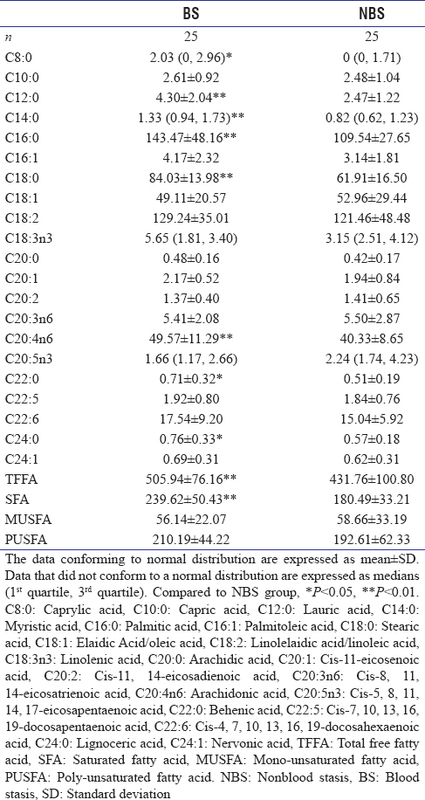 The total incidence rates of vascular plaque in the carotid and femoral arteries and the average intima-media thickness of the carotid artery vascular plaque area and the femoral artery vascular plaque area were significantly higher in the BS group than those in the NBS group (P< 0.05, P < 0.01) [Table 4]. 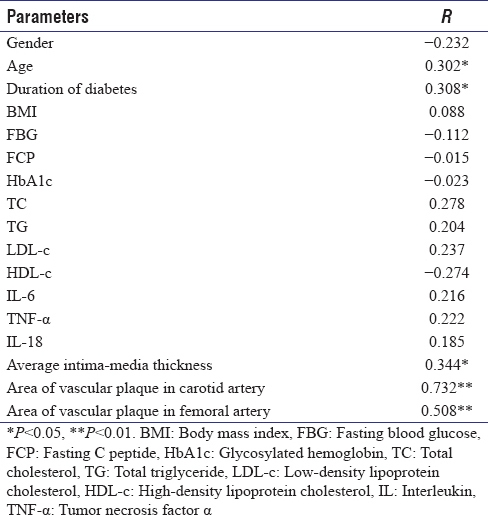 Age, duration of diabetes, intima-media thickness, and the vascular plaque area of the carotid and femoral arteries were found to be positively associated with BS syndrome scores (P< 0.05, P < 0.01) [Table 5]. 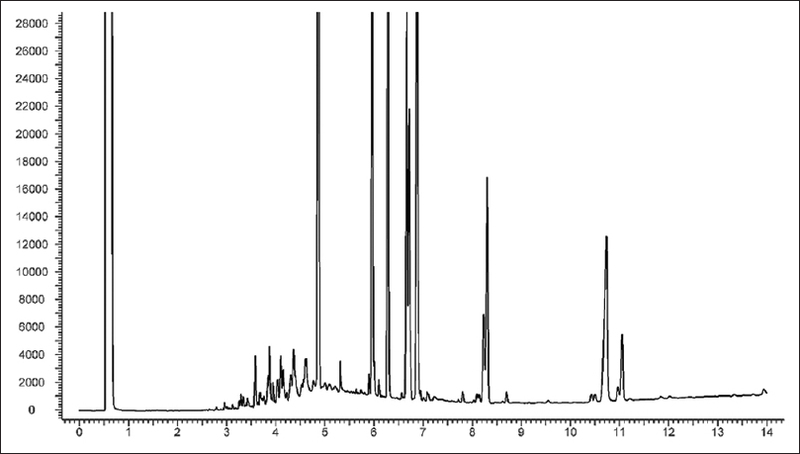 The FFA fingerprint chromatograms of each group are shown in [Figure 1] and [Figure 2], respectively, a nd clearly indicate a difference between the fatty acids in T2D patients with and without BS [Figure 3] shows the fingerprint chromatogram of the mixture of fatty acid standards]. As displayed in the PCA score plot, each group could be separated into distinct clusters [Figure 4], indicating the differences in serum fatty acid composition between T2D patients with and without BS. Variable importance in the projection (VIP) of the PLS-DA analysis highlights contributions to the difference between the two groups. Components with a high VIP score (VIP score ≥ 1) (C18:0, C12:0, C20:4n6, C16:0, C22:0, C24:0, and C18:3n3) may be major contributors [Figure 5]. Combined with a t-test or a Wilcoxon test [Table 6], levels of total FFA (TFFA), saturated fatty acid (SFA), lauric acid (C12:0), palmitic acid (C16:0), stearic acid (C18:0), arachidonic acid (C20:4n6), behenic acid (C22:0), and lignoceric acid (C24:0) in the sera of the BS group were significantly higher than those in the NBS group. Other serum fatty acid levels were not significantly different between the two groups. 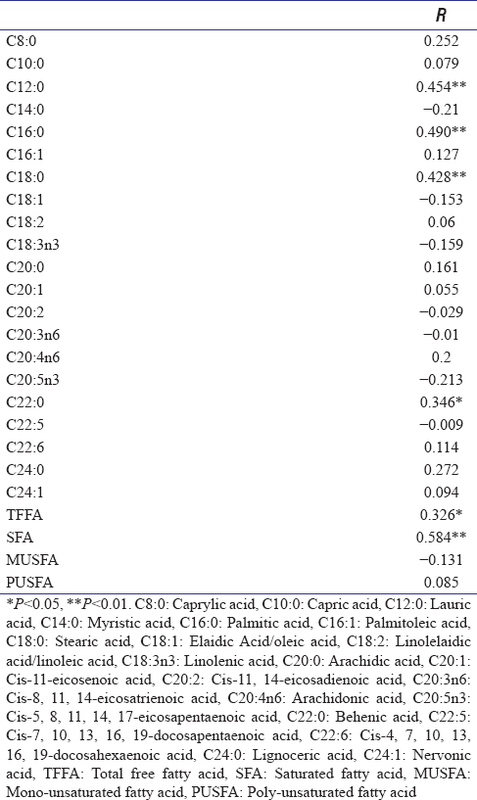 C12:0, C16:0, C18:0, C22:0, TFFA, and SFA were positively correlated with BS syndrome scores (P< 0.05, P < 0.01); however, no correlation was found between other fatty acids and BS syndrome scores (P > 0.05) [Table 7]. A multiple linear regression analysis with BS syndrome scores as the dependent variable showed that C12:0, C16:0, C18:0, C22:0, TFFA, and SFA correlated to BS syndrome scores, but analyzing these factors as independent variables indicated that the regression equation was reasonable (F = 24.82, P < 0.001) (R2 = 0.584). Only SFA (x1) was included in the regression equation: y = −2.56 + 0.042× 1[Table 8]. 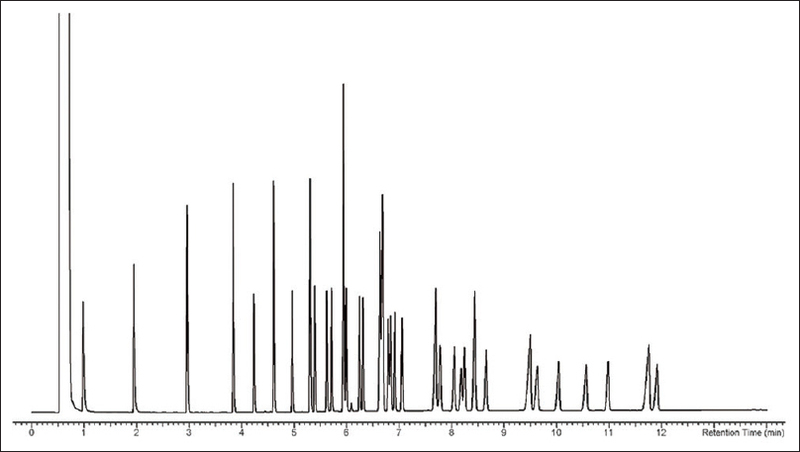 C12:0, C16:0, C18:0, C20:4n6, TFFA, and SFA positively (P< 0.05, P < 0.01), but C18:3n3 and C20:5n3 negatively (P< 0.05, P < 0.01) correlated with plaque area in the carotid artery. 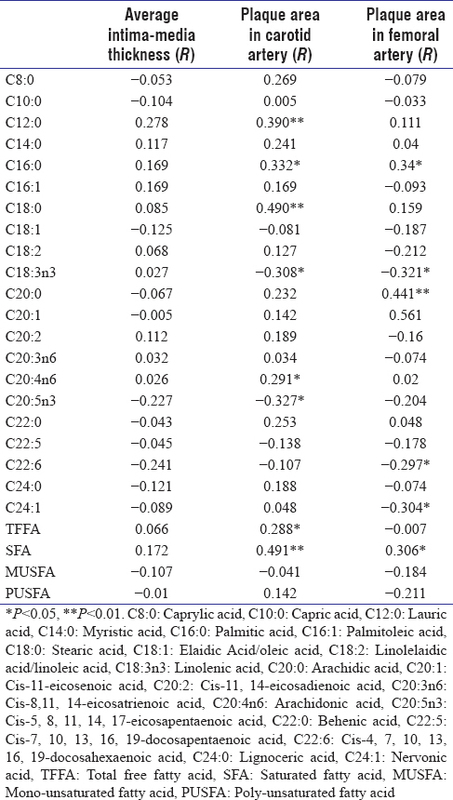 C16:0 positively (P< 0.05, P < 0.01) whereas C18:3n3, C22:6, and C24:1 negatively (P< 0.05, P < 0.01) correlated with plaque area of the femoral artery [Table 9]. Lipotoxicity refers to multi-organ or multi-systemic impairment caused by increased circulating FFAs or increased cellular lipid content., In particular, hyper-free-fatty-acidemia is closely related to macroangiopathy because of the corresponding direct damage to vascular endothelial cells. SFA and mono-un-SFA have strong toxicity for vascular endothelial cells. For example, palmitic acid has been found to induce endothelial cell apoptosis or death. Elevated plasma FFA increases the permeability of endothelial cells, creates and increases the permeability of foam cells, and causes intima-media thickening. FFA has also been shown to increase the gene expression of aminoglycoprotein, leading to accelerated plaque formation. In the study by Serri et al., FFA changed the gene expression of proteoglycan, and as a result, smooth muscle cells produced excess cacoplastic proteoglycans, which easily bound to LDL-c to form deposits and thicken the carotid intima-media. Moreover, cacoplastic proteoglycans have been shown to change the structure of apoprotein B in small-dense LDLs, reducing the affinity of the LDL-c and LDL-receptors; as a consequence, LDL-c must enter the cell through a non-LDLR pathway, resulting in the accumulation of cholesterol in cells, and thereby generating foam cells. FFA can also indirectly damage endothelial function through deteriorating insulin resistance, since hyperinsulinemia impedes prostaglandin synthesis, and reduces nitric oxide, causing endothelial cell dysfunction. We obtained similar results in our research. Plasma FFA levels were significantly different between the BS and NBS groups, in which TFFA, SFA, C12:0, C16:0, C18:0, C20:4n6, C22:0, and C24:0 were found to be higher in the BS group, using a PLS-DA analysis and t or Wilcoxon tests. TFFA, SFA, C12:0, C16:0, C18:0, C20:0, and C22:0 were found to be positively correlated with BS scores, and SFA was included in the regression equation. C12:0, C16:0, C18:0, C20:4n6, TFFA, and SFA were positively correlated whereas C18:3n3, C20:5n3, C22:6, and C24:1 were negatively correlated with diabetic macroangiopathy. Medium-chain and long-chain SFAs were confirmed to be different between the plasma of each group. Long-chain SFAs, such as C16:0 and C18:0, may reduce the activity of nitric oxide synthase in endothelial cells, inhibiting vasodilatation, and may also time-dependently induce endothelial cell apoptosis. C16:0, on the other hand, may stimulate the secretion of inflammatory factors, such as intercellular adhesion molecule-1, leading to endothelial cell dysfunction. On the contrary, C20:4n6 was found to be increased in the BS group, possibly stimulating the synthesis of thromboxane A2, prostaglandin, etc., and causing an imbalance in arachidonic acid epoxides, inducing vasoconstriction, hypercoagulable state, and macroangiopathy. No difference in n3 PUSFAs was found between the BS and NBS groups; however, C18:3n3 and C20:5n3 were lower in the NBS group and were negatively correlated with diabetic macroangiopathy by Spearman's correlation analysis. In addition, our research showed that serum levels of TC, TG, and LDL-c were higher in the BS than in the NBS group. However, they were not correlated with BS scores. Inflammatory factors, including IL-6, TNF-α, and IL-18, were also elevated in the BS group, although their correlation to BS scores was not confirmed. Despite the fact that medium-chain and long-chain SFAs have been proven to be responsible for diabetic macroangiopathy in many studies, they were shown, for the first time in our study, to greatly contribute to the differences in plasma levels of FFAs in T2D patients with or without BS. We also found that changes in serum FFA content in T2D patients were correlated with BS scores, indirectly confirming the relationship between lipotoxicity and BS. TCM theory, as mentioned above, claims that BS is closely related to the development of diabetes or “Xiao-Ke,” which is also acknowledged in several TCM canons, such as the “General Treatise on the Cause and Symptoms of Diseases,” in which the author says that “Xiao-Ke always causes ulcers, because the heat evil blocks in meridian, stopping qi and blood, leading to BS, and inducing ulcers.” However, “BS” in TCM is nearly always a concept that theoretically exists in classical TCM and doctors' minds, but its specific content and effects on pathological changes remain unknown. What is BS? What is the result of BS? TCM theory has not presented a specific explanation. Meanwhile, in TCM, the medical diagnosis for BS comes from patients' symptoms and feelings and doctors' experience, which are subjective and hard to quantify. Moreover, the causes of macroangiopathy and plaque in the vascular system are controversial in TCM. Several TCM theories, such as BS theory, turbid phlegm theory, and qi stagnation theory, appear to provide reasonable explanations, without presenting substantial evidence. In this study, we found that the occurrence of macroangiopathy was significantly higher in the BS group than in the NBS group. On the other hand, average intima-media thickness and carotid and femoral artery plaque areas were positively correlated with BS scores. Therefore, we posit that diabetic macroangiopathy is related to and is a result of BS. On the other hand, different fatty acids were found in T2D patient with or without BS through FFA spectrum analysis, which might contribute to the exploration of biomarkers for and quantization diagnostic models of BS. In addition, we discovered that age of patients and duration of T2D were higher in the BS than in the NBS group and were positively correlated with BS scores. This may be a result of deficiencies in qi and blood in aged patients. According to TCM theory, as a result of deficiency of qi, blood may not circulate normally and may then generate BS. In our research, patient's age, duration of T2D, BS scores, TC, TG, LDL-c, IL-6, TNF-α, the occurrence and area of artery plaque, and intima-media thickness were elevated, and we found that patient age, duration of T2D, intima-media thickness, and area of artery plaque were correlated with BS scores. The FFA spectra and plasma levels were significantly different between the BS and NBS groups. Specifically, TFFA, SFA, C12:0, C16:0, C18:0, C20:4n6, C22:0, and C24:0 were elevated in the group with BS. C12:0, C18:0, C20:4n6, TFFA, and SFA were positively correlated and C18:3n3, C20:5n3, C22:6, and C24:1 were negatively correlated to diabetic macroangiopathy. In conclusion, lipotoxicity was closely related to BS because the levels of plasma FFAs were correlated to the severity of BS. The reasons for these observations should be the subject of future studies. Natural Science Foundation of China (No. 81173253); and Sanming Project of Medicine in Shenzhen (No. SZSM201512043) supported the study. Takeda M, Imaizumi M, Sawano S, Manabe Y, Fushiki T. Long-term optional ingestion of corn oil induces excessive caloric intake and obesity in mice. Nutrition 2001;17:117-20. Yang W, Lu J, Weng J, Jia W, Ji L, Xiao J, et al. Prevalence of diabetes among men and women in China. N Engl J Med 2010;362:1090-101. McGarry JD, Dobbins RL. Fatty acids, lipotoxicity and insulin secretion. Diabetologia 1999;42:128-38. Yang W, Xing X, Lin H, Ma X, Hu Y, Li G, et al. Baseline hypertriglyceridemia, a risk factor for non-insulin dependent diabetes mellitus: A 6-year follow-up study of 432 nondiabetics. Chin J Intern Med 1995;34:583-6. Furuhashi M, Hotamisligil GS. Fatty acid-binding proteins: Role in metabolic diseases and potential as drug targets. Nat Rev Drug Discov 2008;7:489-503. Kong C, Elatrozy T, Anyaoku V, Robinson S, Richmond W, Elkeles RS, et al. Insulin resistance, cardiovascular risk factors and ultrasonically measured early arterial disease in normotensive type 2 diabetic subjects. Diabetes Metab Res Rev 2000;16:448-53. Liu D, Li H, Xiao X. Theoretical and clinical research progress of the method of promoting blood circulation and removing blood-stasis in treating type 2 diabetes. J New Chin Med 2014;46:204-6. Sivitz WI. Lipotoxicity and glucotoxicity in type 2 diabetes. Effects on development and progression. Postgrad Med 2001;109:55-9, 63-4. Yang W. Lipotoxicity, diabetes and dyslipidemia. Section Endocrinol Foreign Med Sci 2004;24:287-8. Zhan X. Effects of Free Fatty Acids on Vascular Endothelial Cells and its Association with Atherosclerosis in Type 2 Diabetes. The General Hospital of the People's Liberation Army (PLAGH); 2004. Tripathy D, Mohanty P, Dhindsa S, Syed T, Ghanim H, Aljada A, et al. Elevation of free fatty acids induces inflammation and impairs vascular reactivity in healthy subjects. Diabetes 2003;52:2882-7. Serri O, Li L, Maingrette F, Jaffry N, Renier G. Enhanced lipoprotein lipase secretion and foam cell formation by macrophages of patients with growth hormone deficiency: Possible contribution to increased risk of atherogenesis? J Clin Endocrinol Metab 2004;89:979-85. Taskinen MR, Smith U. Lipid disorders in NIDDM: Implications for treatment. J Intern Med 1998;244:361-70. Yu Y, Suo L, Yu H, Wang C, Tang H. Insulin resistance and endothelial dysfunction in type 2 diabetes patients with or without microalbuminuria. Diabetes Res Clin Pract 2004;65:95-104. Liu T. The relationship between plasma free fatty acid profiling and type 2 diabetes with subclinical atherosclerosis. Central South University, 2011. Bays HE. “Sick fat,” metabolic disease, and atherosclerosis. Am J Med 2009;122:S26-37. Chen NG, Reaven GM. Fatty acid inhibition of glucose-stimulated insulin secretion is enhanced in pancreatic islets from insulin-resistant rats. Metabolism 1999;48:1314-7. Halle M, Eriksson P, Tornvall P. Effects of free fatty acids and a triglyceride-rich fat emulsion on endothelial nitric oxide synthase. Eur J Clin Invest 2005;35:154-5. Xiao Y, Mu Y, Zhan X, Li M, Lu Z, Lu J, et al. Inhibitory effects of arachidonic acid on the expressions of monocyte chemoattractant protein-1 (MCP-1) and intercellular adhesion molecule-1 (ICAM-1) in vascular endothelial cells treated with palmitic acid. Chin J Diabetes 2005;13:299-301. Patanè G, Piro S, Rabuazzo AM, Anello M, Vigneri R, Purrello F, et al. Metformin restores insulin secretion altered by chronic exposure to free fatty acids or high glucose: A direct metformin effect on pancreatic beta-cells. Diabetes 2000;49:735-40.